Please read this entire page. We do ask that you are prepared for your new puppy to arrive by picking up your puppy supplies at least one to two week prior to the puppies arrival. You will need a crate for the puppy to sleep in; this is his/her safe place. Old or new towels for the crate bedding. Potty pads or doggie litterbox if you are adopting a small dog and want to housebreak them to the pads or litter. A baby gate or puppy playpen to contain the puppy in a small room or area if needed. Food and water bowls, we recommend you getting the stainless steel food and water bowls as they do not hold staff germs if washed on a regular basis. Food and vitamins, two VERY important things your new puppy will need. Diamond Naturals small breed puppy formula for the Min-pin puppies. Diamond Natural large breed lamb and rice puppy formula for bloodhound puppies and NuVet vitamins, the links are on our favorite links page. If you don't have the food in your area and need to order it, then you need to make sure you order at least two weeks prior if at all possible. The vitamins you need to order at least one week prior to the puppy’s arrival. CONTRACT/GUARANTEE We the breeder, guarantee the Miniature Pinscher puppies until six months of age on congenital problems of the heart, hips and lungs only. The Bloodhound, we guarantee until six months of age on the heart and lungs. Bloodhounds can develop bad hips on concrete surfaces. We cannot control the surface your puppy will grow up on so we do not guarantee the hips on them. We do not refund money, but in the case of a problem, we let you pick a puppy from the next available litter. We ask you to pick up or pay shipping as you did with the first puppy. You must call or email us at the first sign of a problem and keep us informed of what is going on. We require a photocopy of all your vet statements so our vet can concur with your vet with any problems found. We put all of our puppies on NuVet vitamins, bloodhound puppies are also put on the NuJoint supplement for the first year of life to help build good joints since they are a large breed big boned animal. If you would like to extend your guarantee with us till the puppy is 1 year of age, you must keep your puppy on the NuVet vitamins for the entire first year, ordering them through our site or calling the company with our ref. code to order. With the code 33039, the vitamin company will contact us with an automated email, letting us know that you have ordered the vitamins. Each time you reorder, we will be contacted which validates your extended guarantee. To validate your guarantee with us from the beginning of your puppies arrival to you, you are required to take your puppy to your veterinarian within two weeks of its arrival to you. You are also required to have your puppy established and set up on a schedule for immunizations with your vet. You are required to send us a photocopy of the receipt from your vet's office, this receipt must have your vets name, address, and phone number on it. Send this with our validation statement signed by you that has been sent with the puppy's paperwork. This paperwork must be on file with us within 3 weeks of the puppy's arrival to you and being placed in your care or the care of a surrogate care giver until you are with the puppy. After the puppy's pick up or arrival to you we do not pay any vet bills, shipping charges, or charges of any kind, for any reason, i.e. ; cut of the ears, the length of the tail, or the hair coat. We cannot guarantee size of a puppy at adult hood. We may give you a breeders guess but keep in mind this is ONLY a guess. Only God and you have control over the growth time of your puppy after it leaves us. (NOTE) Toy breed dogs are known to have crooked teeth, retained baby teeth, etc... teeth and off bites are not covered in our guarantee. (NOTE) Alopecia is a hair coat issue that is not covered with our guarantee. Blue and fawn are diluted colors which have been known to be susceptible to skin problems where the puppy may experience some hair loss. If you purchase a dilute puppy, you may or may not experience this. We have not had this problem in our dogs, but we do not breed dilute to dilute to avoid this issue. (NOTE) Demodetic is contained in the hair follicles of ALL dogs, stress and lowered immune systems of puberty in them can make this appear, although not often. It is a very manageable condition and generally in most cases will disappear on its own. Some instances need veterinarian intervention, it is not covered in our guarantee. Puppies sold as pet, with "limited papers", we ask you to have the puppy spayed or nuetered at the appropriate time frame. Males at 5-6 months and females at 6 months, which has been show to be the optimal time frame to do so. This is very important to the health and well being of your new pet. If you the buyer have purchased your puppy with full breeding and show rights, and a congenital problem is found before your guarantee has expired then we ask for copies of the paperwork from your veterinarian. Our vet will then call your vet to confirm and we will give you two choices. 1. You can get a refund of the $100. extra for full papers after you have had the puppy spayed/neutered and after sending us the paperwork from your vet we request. 2. You can send the puppy back to us and pick a puppy from the next available litter. In most cases we do not refund money. If you the buyer, have purchased your puppy with limited pet papers, and a problem is found. You must send photo copy’s of all veterinarian reports to us. We will then take it to our vet, she will go over all of the papers, call your vet and if they concur on the problem, then we will ask you to either 1. Pick a puppy from the next available litter, sending the puppy with the problem back to us. 2. You can keep the puppy and we will refund a portion of the puppy price. But we do have the right to ask for the puppy back, for an exchange if we deem it necessary and no refunds will be given. Puppies purchased with limited papers are required to be spayed 6 months on females or neutered at 5 months on males. We do hold the registration papers on your puppies in most cases, until we have been sent the spay or neuter certification from your vet. Once we have that we will send out your puppy registration papers. The buyer understands the puppy must be paid in full one week prior to ship date, failure to do so may result in a delay of shipping of your puppy. We ask you please do not put us in that situation. Failure to pay the balance of the puppy may also result in the loss of the buyers deposit, this is left to the breeders discretion. Deposits (which is $200) are good faith bonds between the breeder and the buyer. If you decide you do not want your puppy from us, you are breaking the agreement and loose your deposit. If we break the agreement the buyers deposit will be refunded. 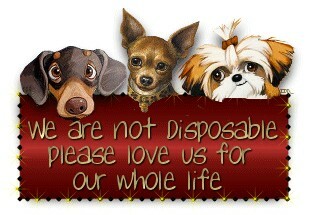 We do have the right to deny any sale we deem will not be a good home for the puppies. We have already implanted, under the skin at the shoulder blades the microchip. You are responsible for registering your puppy's microchip in your name, this is very important and is required for your guarantee to be valid. It does cost you $19.50. Please remember when your new puppy arrives to you it will have had from us, two combo puppy shots and a series of wormers. The puppy does need a total of four combos to be completely covered. You should refrain from taking the puppy to new places for at least the first few weeks until your veterinarian has given the rest of its immunizations. This will ensure you do not put your puppy in contact with another puppy that has not had its proper immunizations and your puppy becoming unnecessarily sick. Please remember that different geographical locations require different immunizations and that we prepare the puppies for requirements in our geographical location. Stress in shipping is normal; it doesn't matter if the puppy goes with the ground transport, flies, or you pick it up. Watch for diarrhea. This is one of the first signs of stress. For mild cases, give your puppy a teaspoon of Pepto Bismol or Keopectate. This will generally clear it up. If you see blood in the stool you will have to get a stronger medicine from your vet. This is VERY important. Please make sure you check this carefully. If you are in an area where you do not drink the tap water, please do not give it to your puppy either. All our puppies are used to clean water, with no additives. Chlorine and fluorides in city water can be hard on their stomachs and cause problems. Our guarantee is between us and the original purchaser only. Our guarantee is not transferable if you resell your puppy or give it away to someone else. Please make sure if you do not own your home that you are allowed pets before purchasing one. Please know the laws of your city and state and what is required of you before purchase as well. Some cities do not allow you to own an intact male or female. All AKC or HPA papers will come to you in the form of a "puppy application" you are responsible for mailing that in to recieve your puppies full or limited certificate. Purchasing on limited papers on spay/neuter contract or full show and breeding rights contract. 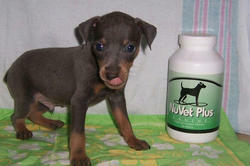 Clicking on the Blue Min Pin puppy takes you to the NuVet Vitamin site. and a couple of murdered throw pillows, I became your best friend. you?" – but then you'd relent and roll me over for a belly rub. banished to another room, or to a dog crate. a photo of me from your wallet and told them stories about me. These past few years, you just answered "yes" and changed the subject. anyone who might save me. of the day, and I padded along the aisle after her to a separate room. of love had run out of days. Perhaps because she understood my dog speak, she said "I'm so sorry." spay & neuter campaigns in order to prevent unwanted animals. but it could save maybe, even one, unwanted pet.